The conventional design of a virtual reality headset in today’s current trend is that it requires a smartphone to work. That has been the case for the consumer-centric ones, although it’s different with the likes of the Oculus Rift and the HTC Vive VR Headsets. 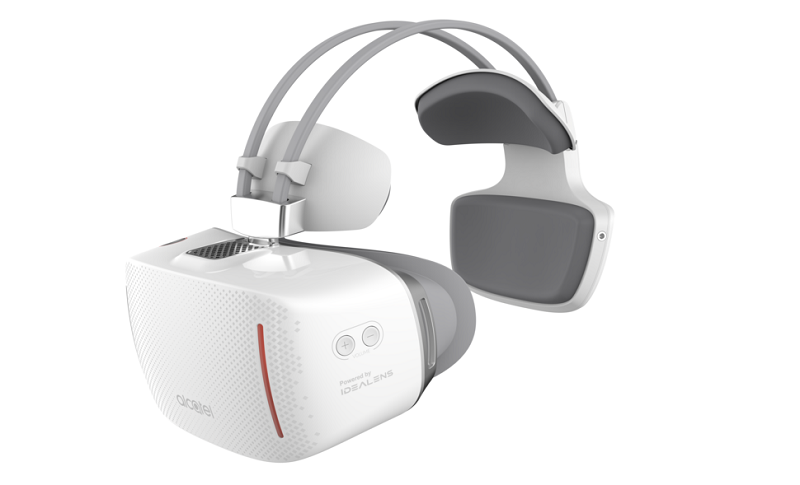 Now, Alcatel is also looking to jump into that foray as it announces the Vision – an Android-based virtual reality headset that doesn’t need a smartphone slotted in to work. The Alcatel Vision features two 3.8-inch AMOLED panels that come with Full HD resolution a piece. Inside the VR headset is an octa-core processor to power it up. There’s also a juicy 3GB of RAM plus 32GB of internal storage setup inside the device. Of course, it has wireless connectivity options such as Wi-Fi, Bluetooth, and LTE. And since it’s a virtual reality headset, you can expect sensors such as the proximity sensor and a gyroscope in tow. Judging from the images, Alcatel’s new offering seems to be well cushioned for its comfortability. It doesn’t have rough edges, too. Furthermore, it even has the capability to adjust for myopia, so you won’t need to wear glasses or contact lenses whenever you have this on. The Alcatel Vision is pegged for a 2017 release. Exact pricing is still unknown at the moment, but reports suggest that it will be priced somewhere between $556 to $669.